It may only be Wednesday, but it feels like it has been a full week already, and there’s plenty more to come! In Michigan, we are steeped in snow and in the midst of another Polar Vortex, but we are not alone – a good swath of the country looks to be frozen along with us. One place it’s not frozen is Florida, which is good because it’s Spring Training time! My Tigers have a few new faces (Cespedes, Gose, Greene and Simon), a few question marks (the rotation) and some injuries to see through, but few things can bring warmth to a sub-zero winter day like the thought of baseball. So what to drink when the weather is so very cold? How about trying something Barrel Proof? And that’s exactly what I did, with a glass of Elijah Craig Barrel Proof! 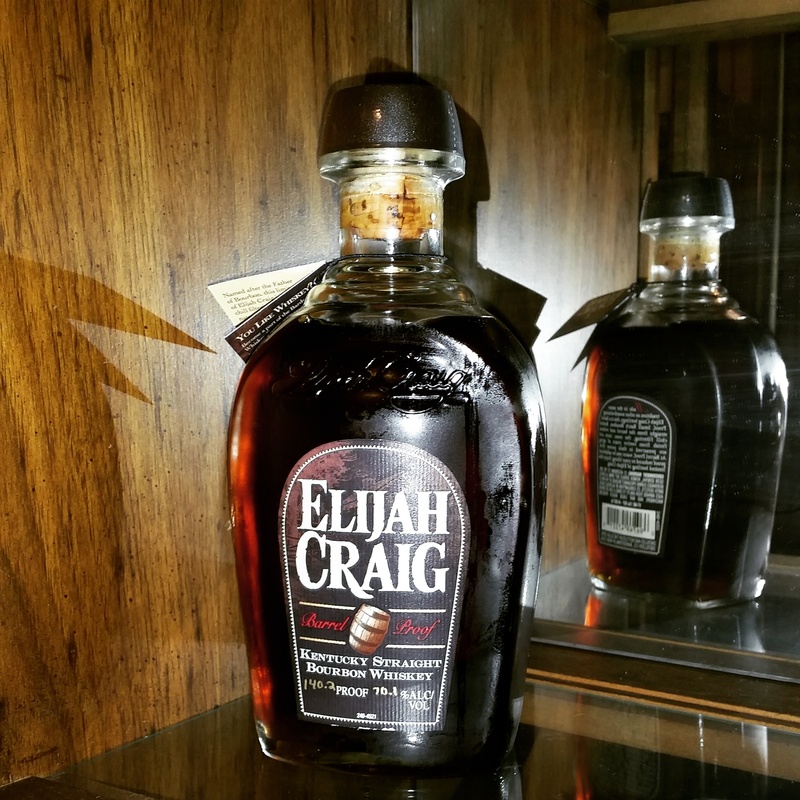 The most recent issue of Elijah Craig Barrel Proof is it’s sixth offering, although I haven’t been fortunate enough to run across the earlier five myself. It is also the highest proof, at a little over 140. No laughing matter here. Heaven Hill barrels this direct – no char filtering – and it shows in the color. Even in the bottle, it’s a very deep brown. They have accented that with a dark label, and it is just distinctive enough to set it apart. I have respect for 12 Year Elijah Craig, even if it’s not my first choice (it is, however, my first choice in baking – it’s spiciness adds much to pies, cookies and chocolates!). How would this one fare? The deep, dark amber-brown color of the pour lets you know right away that this is not a light and breezy pour. But what really amazed me was the nose – a 140 Proof glass should burn, but this most certainly does not. There are many wonderful, unique and often, sweet aromas in this glass. Rich vanilla, caramel and the smell of warm baking, like a gingerbread man iced with maple frosting. Does that sound unique? It surely shocked me – there was no great burn, just the wholly unique smell of sweet baking in a wood fired oven. The taste brought me back to earth and how. The tip of the tongue held that sweetness of caramel before the proof hit. In baseball, a pitcher might throw a fastball up around the batters shoulders to brush him back a bit, or get him to swing wildly at an eye level pitch – the ‘high heat.’ This drink is the ‘high heat,’ and the first sip admittedly knocked me back for a second. The nose had lulled me to sleep, but 140 proof woke me up fast. I caught my breath and tried again – slower this time. There is a slightly burned sugar taste, brown sugar to be more specific. Wood weighed in heavily, but not overwhelmingly, as the toasted oak blended well with the toffee, maple flavors. It has a long finish, and a whole lot of burn. THe wood is probably strongest in the finish, and I’ll admit, it went on a little too long for me. Such a high proof leads to a long finish, and this one left traces of oak, alcohol bite and burnt toast on my palate for minutes. So how do I rate it? I thoroughly enjoyed it – not unlike a roller coaster that gives you a great start, but maybe by the end you wish was a little bit shorter, this version of the Elijah Craig Barrel Proof is a great ride. I look forward to trying other, varied proof versions.